As I've mentioned, I'm slowly working my way back into music. Until recently, for any guitar playing I was using an old classical guitar I have lying around. However, a couple of weeks ago, my old bandmate Wayner let me borrow one of his Jackson guitars and his Marshall cab to play around with. 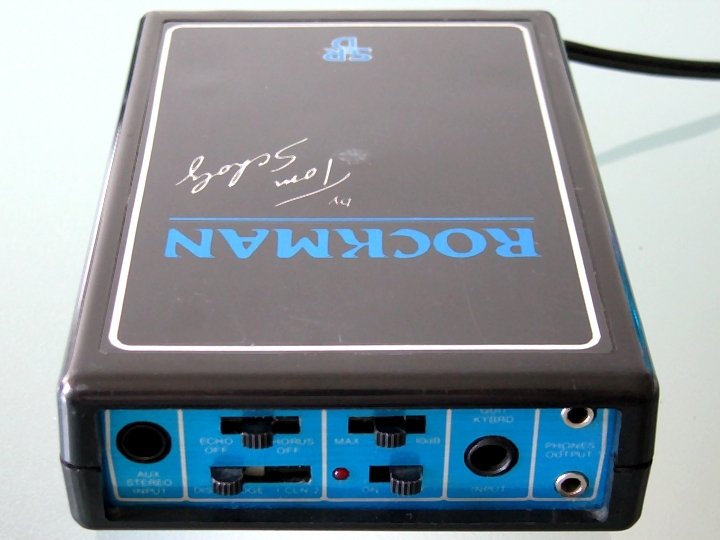 For those uninitiated, the Rockman is a headphone guitar amp that was originally designed/built by Tom Scholz of the band Boston (he was also an MIT trained engineer). I remembered that I still had Wayne's Rockman from way back (1989 or so) sitting in a box in the closet, so I decided to bring it out and give it a try. Well, let me tell you... I forgot how great this thing sounds! Throw on some headphones, crank it up and suddenly you have the _exact_ chorus/echo guitar sound of Boston. The cool thing about the Rockman is how well designed/thought out/built these things were. Little things like having an aux input (so you could play along with other input like a tape/cd player) and multiple headphone outputs. Also, it had such a clean signal you can even use it for recording. Just a great design.